Engine compression testing is a common task in the workshop, and therefore technicians need the right kit to help them accurately diagnose engine problems or look to measure and improve engine performance. This is especially true in a busy workshop, where you need a compression test kit that’s efficient, easy-to-read and built to last. Draper Tools explains. Draper has launched a brand new compression range, featuring petrol and diesel compression test kits, a vacuum pump, a cylinder leakage kit, an oil pressure test kit and much more. This series of kits is now one of the most comprehensive compression ranges on the market. It’s packed full of essentials for engine and transmission maintenance, each supplied in a blow mould case for safe storage and extra protection. One highlight of the range is the Draper Expert Vacuum & Pressure Test Kit (stock no: 35883). With a 4 bar pressure range and a bold, easy-to-read display, this kit is suitable for a range of applications, such as fault- finding and bleeding brakes. The new range also includes the Draper Expert Digital Petrol Compression Test Kit (stock no: 35885). Featuring four pressure scales (psi, bar, KPA and Kg/cm2) in a handy digital display, it quickly and accurately checks the compression on petrol engines. The kit includes a high-pressure, stainless steel braided hose, ensuring it’s resilient against adverse conditions. 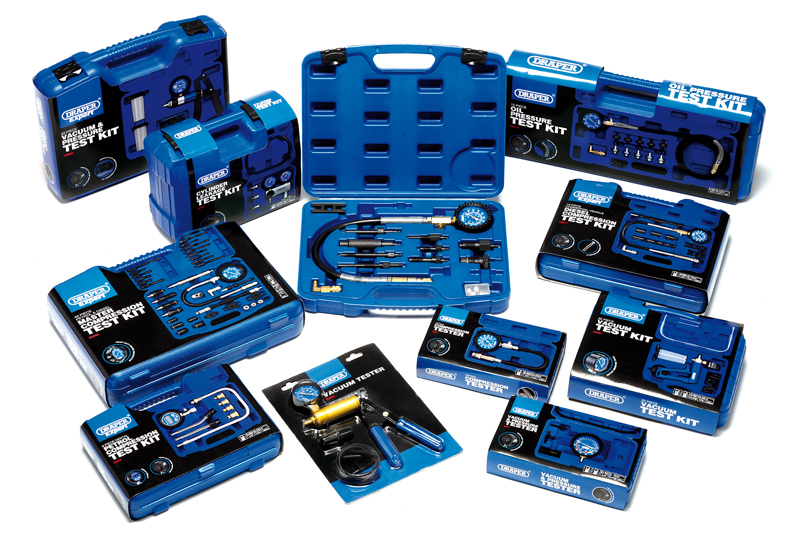 The biggest kit in the new range, the Draper Expert Petrol & Diesel Master Compression Kit (stock no: 35886) is essential for a busy workshop. It’s a comprehensive kit for testing the compression and leakage on a wide range of engines, covering most manufacturers’ vehicles. Unlike other kits in the series, this one can be used for both petrol and diesel engines. It also comes fitted with anti-kink coils to help protect the hose and ensure maximum durability. The entire range has been devised with ultimate efficiency in mind, demonstrated by the specially designed, easy-to-read blue and white gauges. Long-lasting durability and quality are at the heart of the range; with improved rubber covers to enhance protection and tough blow mould carry cases.